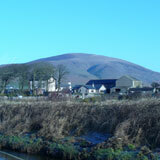 Manor Farm is situated on the edge of the village of Kirksanton just off the A5093, 2.5 miles north of Millom. 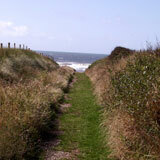 It is approximately one hour’s drive from the M6 motorway. Exit the M6 at junction 36 onto the A590. Keep left. Leave the dual carriageway at the first exit after 1.5 miles following signs for Barrow. Follow the road for approx. 18 miles through Newby Bridge and take a right turn at the estuary at Greenodd, towards Workington/Whitehaven [A5092] and then onto the A595. Follow the road for about 15 miles over the fells at Grizebeck passing Broughton in Furness. Do not take the left fork for Millom but continue on the main A595 road down the Whicham valley by the slopes of Black Coombe. At the T junction take a left onto the A5093 which will bring you over a railway crossing into Kirksanton. Take a right turn by the King William pub down a no-through lane. Manor Farm is two minutes drive past a sharp bend situated on the left after a few white cottages. On arrival at the courtyard gate Maggie will be pleased to meet you and direct you to the allocated parking area. Alternatively you may wish to reach us by taking the left fork through The Green and The Hill to Millom and back out onto the coast road [A5093/A595 Whitehaven]. After 2.5 miles you will come to another level crossing and the village green at Kirksanton. Turn left at the King William pub and follow as before. We look forward to welcoming you. Click here for an interactive map of Manor Farm Holidays (opens in a new browser window).